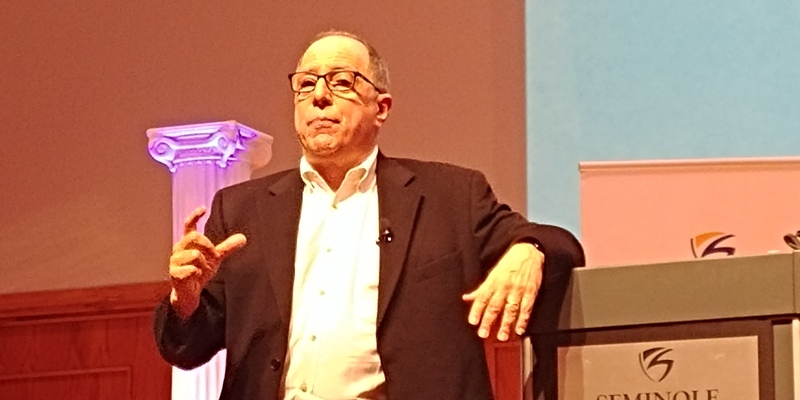 Michael Kimmel speaks at Seminole State College Feb. 6. Seminole State College students and alumni have recently expressed interest in seeing more balance in the College’s speaker series topics. The last three speakers who were invited to lecture are Naomi Wolf, a feminist and author; Michael Kimmel, noted as “the world’s most prominent male feminist” by The Guardian; and Ryan Sallans, a sexuality educator who speaks of his transition from female to male. “If you are insistent that you are for free speech and that you wish for everyone to have their voice heard and you believe that college is a place where ideas can be shared, then you should want to invite other conservatives to speak,” said Kirsten Zima, a mathematics major who graduated from SSC in 2016. Zima talked about the importance of the First Amendment and the significance of having open college debate where a wide range of views are presented. “You see free speech being suppressed so much these days,” Zima said, “and this country is so unique that you can have free speech.” She said if SSC’s speaker series hopes to be balanced and open to presenting a wide range of ideas, it would do well to invite more conservative speakers this year to help round out perspectives. When some faculty were asked about this, they declined to go on the record. Dr. Jordan Camenker, a legal studies professor, however, weighed in. Camenker attributed the main concern with inviting a speaker like Shapiro to heightened security costs. He said inviting conservative speakers onto college campuses has the precedence of creating riots, but not when it is the other way around. Ellie Larson, a dual enrolled student, said she agreed there should be more balance in Seminole State’s speaker series. Kelly Woodford, another dual enrolled student, said she believes it would be more than fair to try to follow up with either of Camenker’s recommendations to get Shapiro on campus. She also believes it would be fair to invite other conservatives such as Roaming Millennial, a YouTube personality. Students indicated that they are working to see whether they can implement these ideas. For more information, visit the speaker series webpage at www.seminolestate.edu/speaker-series/.